Popular, only top quality live rolls are produced at Canak Industries. NEW: 6" live roll with an OD of 6.625" with a schedule 120 wall thickness. Can be made as locking/ratcheting roll. Standard Sizes: Ø5" with a 0.500" wall thickness and Ø7" with a minimum wall thickness of 0.500". Ø 7" roll can be made as a locking/ratcheting roll. These two sizes are made from P110 material. 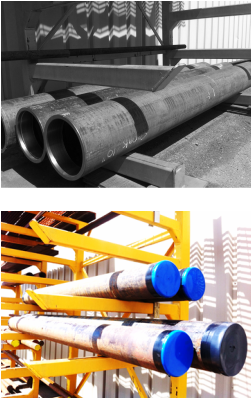 Large Standard Sizes: Ø8" with schedule 120 wall thickness, Ø10" with schedule 120 wall thickness and Ø12" with schedule 100 wall thickness. Upon request Ø10" rolls can be strengthened internally with a stiffener. The larger standard size rolls are made from pipe. Lengths for all the live rolls will be custom cut to meet the customer's needs. All sizes can be completed with support rollers and standard end plates. End cups, end shafts and bearings can be purchased separately. All live rolls, whether manufactured here or not can be brought to Canak Industries to be repaired. All of Canak Industries' live rolls come with a one year warranty. Support rollers can be bought as a combination with pin and nut or it can be purchased on its own. Ginpole rollers can be bought as a combination with ginpole and pin or it can be purchased on its own. Can be purchased with the pin or just on its own. 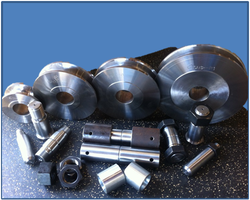 Guide rollers are made of extra heat treated P110 material and are induction hardened. Can come with and without lip. Pins can be purchased at additional cost. Pin and bushing can be purchased at addition cost. Standard sizes: Ø6", Ø9", Ø10", Ø12", Ø14"
A fitting NC nut can be purchased at an additional cost. Standard sizes: Ø2" and Ø2.25"
A fitting NF nut can be purchased at an additional cost. We can do snatchblock assembly. Standard size: Ø2" and Ø2.25"
Can be purchased with a ginpole cup sleeve at additional cost. We can do ginpole assembly. We only have one standard size however we make custom king pins according to customer's drawings. Custom made pins, bushings, sleeves and other parts.